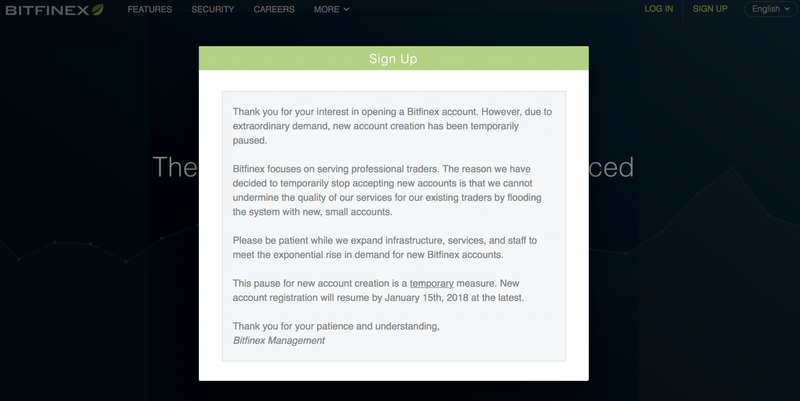 One of crypto’s biggest exchange has suddenly temporarily closed new accounts registration without making any announcement to the effect. When you try to create a new account, you are met with a screen which basically says that you can not sign up. Their justification appears to be a desire to provide a better service to professional traders, however we have not heard any complaints about Bitfinex’s trading engine, while it appears there are complaints about almost everything else. They have said a number of times they are under DDoS and apparently one DDoS method used, and a seemingly unstated reason for suspending registration, was new accounts creation. A justification that reminds us of MT Gox some four years ago calling themselves victims of their own success due to too many new accounts being created. “We are currently working on a new program whereby existing users will be able to invite a limited group of new users to sign-up or [sic] the Bitfinex platform. Once this has been finalized then we will notify existing users who qualify with details regarding this program. At this time, and until such a time as the new program is operational we will not be accepting new users to the platform,” Bitfinex allegedly says. “In light of the events of the past month, we are in the process of developing and building a new platform, and we will be slowly phasing out and discontinuing the current wallet services and all old addresses. To prevent against possible loss of funds, users should not attempt to deposit any funds to their old wallet or deposit addresses. Additionally, while the new system is being built, we will be disabling new signups on the platform,” Tether says. They further make it clear that US based customers can not redeem their Tether, raising questions as to what exactly was bought by American citizens when they, as Bitfinex generally claims, sent them dollars for Tether. “Until we are able to migrate to the new platform, the purchase or sale of Tether will not be possible directly through tether.to. For the time being, though, we invite you to use the services of any one of a dozen global exchanges to acquire or dispose of Tethers for either USD or other cryptocurrencies. Such exchanges and other qualified corporate customers can contact Tether directly to arrange for creation and redemption. A statement which suggests they are closing shop for the time being until the new platform arrives, and yet they just issued another $50 million. 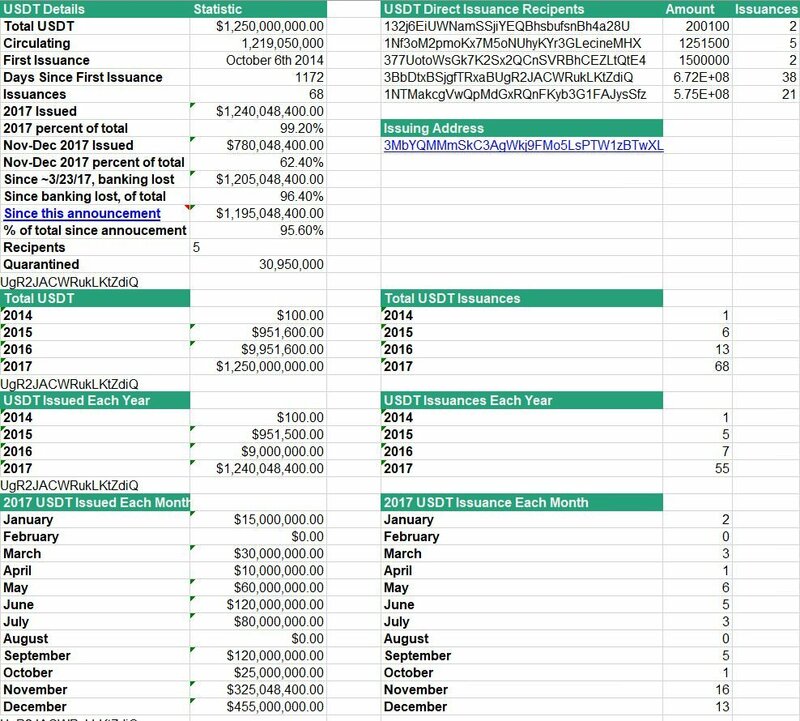 The above unverified stats show that $1.2 billion Tether (USDT) was issued this year, compared to just $9 million in 2016. Nearly half a billion of it was issued in December alone, with 800 million created in just two months, but the more interesting stat might be the direct issuance recipients. There are apparently just five of them. And if that means what we think it means, that suggests there are only five individuals/accounts that have received more than a billion dollars. Those five might be exchanges, such as Bittrex or Bitfinex itself, with Tether stating that USDT is created when an individual in effect sells their, say, bitcoin for USDT. Thus if you have say $100 worth of btc, you sell it, but instead of receiving actual USD you receive newly created USDT. However, those bitcoins are bought by someone, so you no longer have them. They in effect have gone. 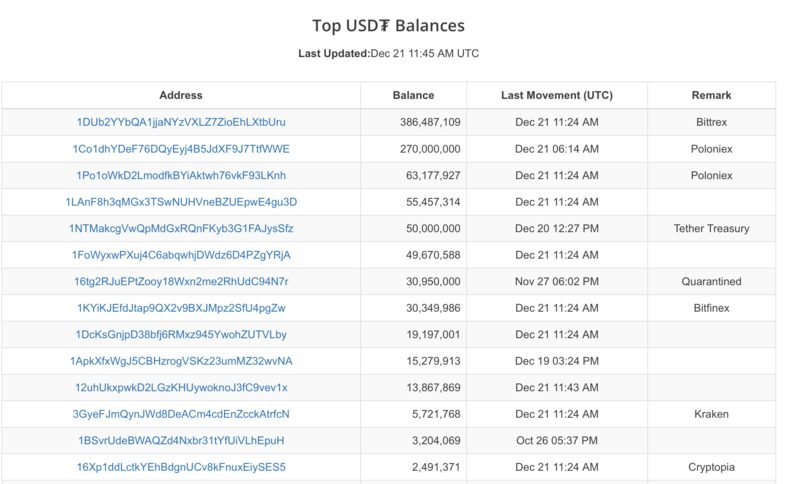 Actual dollars have not moved, so where do they come from to back the USDT which was just created? The only legitimate answer can be that when you sold the btc, you didn’t sell it to a peer, but to the exchange itself. The exchange then either gives Tether the btc equivalent in dollars amounts, or sells it and gives them actual dollars. Even if we suppose that all parties are completely legitimate and fully honest, the considerable volatility in bitcoin’s price where falls and rises of 20% and even 50% are a familiar occurrence may mean the exchanges are taking considerable risk. 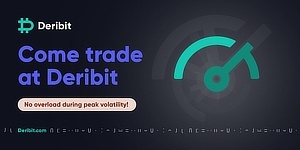 Especially as many of them are crypto-exchanges only, dealing not with dollars, therefore conversion may take time, and time in this space often means high volatility. That’s without addressing other matters, such as exchanges trading on their own platform while knowing all the hidden and unhidden orders, the amounts each holds, and so on. However, just to be clear, we are making assumptions about the process, but it is difficult to see how else it could operate in a legitimate manner. With the latter being somewhat in doubt because Bitfinex is under a banking blockade, so it’s unclear how these billions of dollars are moving, even if it is between exchanges. 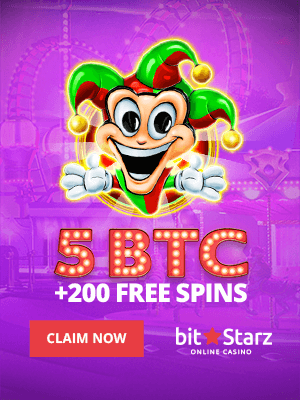 Now, they are also closing new registrations while denying potentially millions of dollars to US customers who can seemingly no longer redeem the tokens. With what is stated to be temporary often becoming permanent in this space. As many may remember, the temporary shut-down of Chinese exchanges was not temporary at all, and the temporary difficulties in withdrawals from MT Gox became bankruptcy. That might not be the case with Bitfinex or Tether, but until they prove otherwise there are reasons for concern, especially in light of numerous incidents and events. Would it be dangerous to hold a % of our crypto in exchanges like bittrex & others (not Bitfinex)? I don’t hold any tethers at all… Only crypto for day to day trading (with crypto pairs). When sh*t happens with tether and mr. Bitfinex, are other exchanges that used usdt pairs gonna shut down also? Or they can justify that thethers cannot be compensated but crypto yes? Or we lose our cryptos as well?